In recent years, Information technology and communication is seen as rapidly grow-ing sectors in Nepal. With access to the Internet, dissemination of knowledge has never been so convenient. The use of information technology to operate rescue and search during the recent earthquake was evident with respect to the importance of In-formation technology and communication in society. Furthermore, Information and Communication Technology (ICT) gives us a medium to enjoy citizen’s freedom of speech and expression. However, ICT sector has also raised various concerns. With an aim to address these concerns and promote ICT in sectors of health, education, ag-riculture, youth, women and among others, Government of Nepal under Ministry of Information and communication have drafted “ National Information and Commu-nication Technology (ICT) Policy 2015” intended to create a vision of ‘Digital Ne-pal’ to achieve knowledge and information based Nepalese society. The draft was re-cently open for public consultation. Previously, there have been few attempts to bring policy on Information Technology and communication. The proposed draft seems to be a very comprehensive document with an aim to promote e-commerce, Internet access among others. The one of the goals of the policy is to increase digital literacy skill by at least 75 percent and 90 per-cent penetration of broadband services with high speed by the end of 2020. No doubt, the draft seems to be very promising, aiming to address all the contemporary issues related to information technology and communication. However, there are few as-pects, which are left out or need more attention. 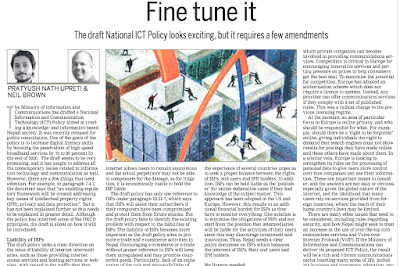 For example, at paragraph 7.4.7, the document emphasis on ‘an enabling regulatory framework will be created addressing key issues of IPR, privacy and data protection, but there is not much in the way of elaboration in the document on this point. Although, the policy have inherited some of the OECD principles, but the draft is silent on how it will be introduced either through legislative protection. The draft policy lacks any clear direction on the issue of liability of Internet interme-diaries, such as those providing Internet access services, and those providing hosting services or websites, with regard to the traffic that they carry and the content that they host. Getting this right will be critical. There are two main schools of thought on this area of law. In several jurisdictions, considering the difficulties in tracing user in cyberspace, ISPs are held liable for the action of third parties subject to certain condition. Mostly, ISPs are held liable be-cause: (i) actual perpetrators cannot be traced as Internet allows user to remain anon-ymous (ii) the actual perpetrator may not be able to compensate the damages, so for litigation it is economically viable to hold ISP liable. The draft policy has only one reference under para 12.21.7 on ISPs, which does emphasis on ISPs assisting an indi-vidual in indemnifying whether their computers have been compromised or to protect from future attack. The draft policy clearly fails to identify the existing problem with respect to liabilities of ISPs. The liability of ISPs becomes more important, as the draft policy substantially aims to promote e-Trade and E-Commerce activities in Ne-pal. Therefore, encouraging e-commerce or e-trade without proper reference to ISPs will make e-commerce unregulated and may promote counterfeit goods. Particularly, lack of ISPs role and responsibilities will encourage the violation of Intellectual prop-erty rights, hampering right holder business. Therefore, there has to be a proper policy on liabilities of Internet service providers upon falling to control infringing goods or knowingly providing a forum for infringement. Additionally, proper ISPs regime is needed to also to address the issue of digital copyright. The draft policy seems to give high priority in protecting and enforce Intellectual property Rights through online, which have been referred on several occasions. This is something, which is apprecia-ble from policy maker’s but again past experience of several country encourage to have a proper balance of protecting rights of services providers and end users along with Intellectual property right holders. In addition, ISPs can be held liable as ‘pub-lisher’ for an online defamation case if the service provider had knowledge of con-tents of subject matter. This approach has been taken my several jurisdictions like United States and Europe. However, the recent experience of these jurisdictions wit-ness additional financial burden for the service providers for the monitoring process. An alternative school of thought, borne out of the current and evolving situation in Europe, is to minimise the obligations placed on service providers, cautioning against starting from the position that intermediaries should be liable for the activities of their users since this is likely to create a regime which discourages investment and innova-tion in connectivity and new services. Instead, this position advocates broad protec-tions for intermediaries, protecting them from liability for the activities of their users. Affording appropriate protection for intellectual property is a factor in the inevitable balancing act, but it is only one factor, and any approach which burdens service pro-viders with obligations to protect others’ business models must be thought through very well, as an imbalanced regime is likely to discourage providers from creating exciting new services which make the most of the proposed new high speed infra-structure. This is not an easy balance to get right; it is has been the subject of ongoing debate within Europe for many years and is far from settled. Thus, Nepal needs a clear policy document on Internet service providers balancing both the interest of services providers and their end users along with intellectual prop-erty right holders. In Nepal, the Information and Communication sector is in nascent phase of develop-ment. Nepal can learn from European experience, Europe has gone through a radical change in its communications environment over the last 12 or so years and continues to adapt its approach. One of the key considerations for the Ministry is likely to be around competition in the provision of high-speed communications services, and the extent to which private companies can become involved in providing communications services. Competition is critical in Europe for encouraging innovative new services and for putting pressure on prices to help consumers get the best deal. To maximise the potential for competition, Europe has adopted an authorization scheme which does not require a licence to operate; instead, any provider can offer a communications service provided that they comply with a set of published rules. This was a radical change to the previous licensing regime. An area of particular focus at the moment in Europe is that of privacy online, and the evolving thinking as to whom should be responsible for what: should, for example, there be a “right to be forgotten” online, giving individuals the right to demand that search engines must not show results for postings they have made online, and poten-tially posts which others have made about them. In a similar vein, Europe is looking to strengthen its rules on the processing of personal data, to give users more control over how companies can use their information. These are important issues to consid-er, and answers are not easy or obvious, especially given the global nature of the In-ternet, and the likelihood that many users rely on services provided from foreign countries, where the reach of their home country’s laws may be limited. There will be many other issues to consider, including rules around security of ser-vices, and how, if at all, Nepal might seek to treat a (perhaps inevitable) increase in use of over the top communications services and VoIP but, above all, the Ministry’s proposed plan presents an exciting opportunity for Nepal. If the Ministry of Information and Communication can deliver to its proposed Nation-al Information and Communication Technology Policy, the outcome should be rich and vibrant communications touching many areas of life, including business and commerce, education, social pastimes and enjoyment, as well as healthcare and gov-ernment. As a vision for the future, it is impressive. Inevitably, careful thought will need to be given to the detail of implementation, and we suspect that much work will lie ahead for the Ministry in this regard.